NEW YORK (Reuters) - A federal appeals court in Manhattan rejected appeals by a music licensing group and music publishers that could have forced Internet radio service Pandora Media Inc to pay higher royalties and have access to fewer songs. It also said rules governing ASCAP licensing "unambiguously" barred music publishers from negotiating higher rates for their works with "new media" users such as Pandora, even as ASCAP licensed the same works to other users. Vivendi SA's Universal Music Publishing, Sony/ATV Music Publishing and EMI Music Publishing had withdrawn their new media licensing rights from ASCAP, while retaining membership in that group. Wednesday's decision is a defeat for publishers and songwriters who believe growth in streaming music has resulted in unfairly low licensing rates. It upheld rulings by U.S. District Judge Denise Cote in Manhattan federal court, which reviews ASCAP rate disputes under a 1941 antitrust consent decree. 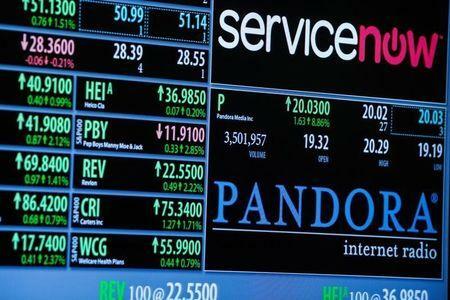 Pandora is the most popular Internet radio service. The Oakland, California-based company last month said it has more than 250 million users, including 79.2 million "active" users, who listen to 1.77 billion hours of music each month. ASCAP Chief Executive Elizabeth Matthews said the decision shows the need to change licensing rules that are "completely out of step" with how people listen to music today. Universal was not immediately available for comment. Sony/ATV, which administers the EMI catalog, had no comment. Kenneth Steinthal, a King & Spalding partner representing Pandora, said the decision helps ensure "equal treatment under the consent decree, including the right to perform all works by all publishers that are ASCAP members." The 2nd Circuit said Cote did not commit "clear error" by requiring Pandora to pay ASCAP a royalty rate of just 1.85 percent of revenue to use its songs from 2011 through 2015. ASCAP proposed an escalating rate that peaked at 3 percent. Moreover, the court said it could not "rewrite the decree" to let publishers pick and choose how works are licensed. "The licensing of works through ASCAP is offered to publishers on a take-it-or-leave-it basis," it said. ASCAP has about 525,000 members, and represents music from artists like Leonard Bernstein, Beyoncé, Duke Ellington, George Gershwin, Alan Jackson, Jay-Z and Katy Perry. The cases are American Society of Composers, Authors and Publishers et al v. Pandora Media Inc, 2nd U.S. Circuit Court of Appeals, Nos. 14-1158, 14-1161, 14-1246.